There are only two goals when configuring server disks: risk avoidance and best performance. Regardless of usage or application, some best practices are universal. Separate system and data. Discrete containers for the operating system/applications and data simplify maintenance, security, and disaster recovery. Moderate cost. With this strategy, you spend moderate cost for hardware while avoiding expensive reconfiguration or disaster recovery using other approaches. Hardware RAID preferred. Implementing redundant disks with hardware is significantly faster than software RAID with easier maintenance and fewer failures. RAID 1 system container. Mirrored system drives allow a server to run with no downtime upon the failure of one drive. Entire disk for system. You cannot extend a system partition, so it is recommended to format the full disk for the operating system. OS and applications only. The system partition should not contain data. Installing applications on special role servers like domain controllers and firewalls should be avoided. Buy the best disks you can afford. SSD is the most expensive. SAS is middle of the road for cost, but much better performance than SATA. RAID 5 most common. Striping with parity requires a minimum of 3 drives and continues operating with the loss of one drive. This configuration generally provides more useable disk space than other approaches, except RAID 0. RAID 50 best speed/space/redundancy combination. 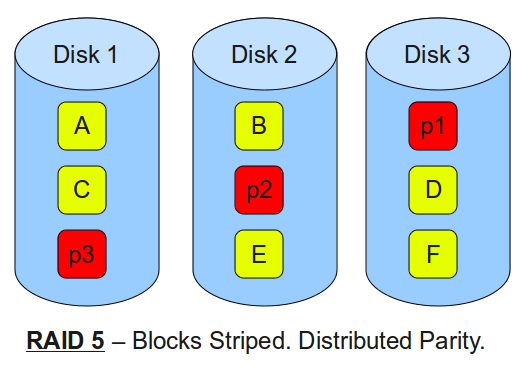 Requiring at least 6 disks, this approach uses RAID 0 striping across 2 or more RAID 5 elements. The collection may lose a drive in each RAID 5 element and still function. For a large number of high-capacity drives, a Storage Area Network with RAID 50 is recommended. RAID 10 for high I/O. A stripe of RAID 1 mirrors requires at least 4 drives. RAID 10 can function with the loss of a drive loss in each RAID 1 element, but has approximately half the useable disk space of RAID 50. This configuration provides the highest throughput of any other configuration except RAID 0 for e-mail and database applications. RAID 6 not recommended. Briefly popular as the assumed next version above RAID 5, this approach comprises striping with double parity and fault tolerance of 2 drive loss. Unfortunately, RAID 6 has marginal comparative useable disk space and comes with a significant performance penalty. RAID 0 fastest and highest risk. With simple striping across 2 or more disks, you achieve the highest throughput and the most useable disk space. However, the loss of a single drives results in complete data loss. This guidance is provided as part of proven managed services standard operating procedures since 1996. For example, solutions like virtualization consist of RAID 1 system container for HyperV and RAID 5 data container for virtual servers.